Alivia is graduating from my Alma Mater, Westerville South! She is a member of the marching band, Class 2018! We shot her senior session in German Village, centering it around Frank Fetch Park in Columbus, Ohio. Sam Antics styled this photoshoot for the "NO' is a complete sentence" theme. A woman doesn't owe anyone a response, a number, a smile, or her body. Shot in Weiland Park Neighborhood, Columbus, Ohio. Abby Olsen is one of those young talents you need to watch out for. She has an eye for detail and a flair for fashion I DEFINITELY wish I had when I was her age, and even now! Her website, www.abbeymikedesigns.com, details her journey with designing. 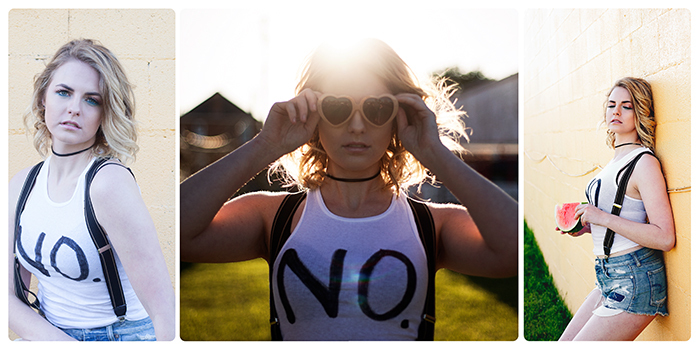 We shot a series of portfolio images for her at Columbus Park of Roses. She brought 4 designs, one that she had made especially for the shoot the week before! Abby is still in high school and is already an accomplished designer. Her fun can-do attitude is certainly refreshing, as are her unique designs. "Clothes Made for Happiness," the tagline on her website is an aptly placed idea for such a talented and cheerful all-inclusive young designer. She makes homecoming dresses for her friends and sister as well as commission designs for customers. This photoshoot for her designs her first time in front of professional camera with her dresses. It only took a few peaks at the back of my camera to see how awesome her designs looked on camera for her to get comfortable and excited about getting the shots! Abby with Abby Mike Designs is certainly one new young designer you don't want to miss out on! She does take limited commission, remember, she's still in high school! She can be contacted through her website or on facebook atwww.facebook.com/abbymikedesigns/ . More from her portfolio shoot can be found on my facebook. Willow was essentially my last model shoot before I sent my gear out for service, so it is only fitting that she be my Flashback Friday today. Yesterday I called the service repair company for an update on the schedule of repairs. They don't have an update. I would be fibbing if I didn't say that was disappointing. So, to combat that, I'm sharing the awesome images from this shoot! We shot at an urban location and I was sick as a dog trying to focus my faulty focusing camera (hence the repair!). I almost fell off the ramp to the building because I couldn't see it! It's cool though, WIllow had my back.